Relatives of a policeman jailed in Zimbabwe for using a toilet reserved for President Robert Mugabe are appealing for his release. The policeman, Alois Mabhunu, was arrested last month in the city of Bulawayo after he used a special presidential toilet at a trade fair. A police court on Wednesday ordered his imprisonment for 10 days. 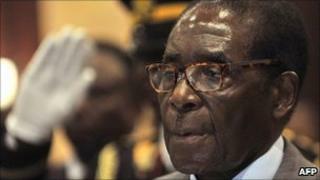 Zimbabwean human rights lawyers said there was no law forbidding people from using the president's toilet. They said Mr Mabunhu should not have been arrested. Mr Mugabe, 87, visited Bulawayo, the country's second city, for the opening of the annual Zimbabwe International Trade Fair on 6 May. Mr Mabunhu was on duty when he was caught short and rushed to use the reserved toilet. He was arrested several days later. According to Zimbabwe's Daily News paper, his charge sheet did not specify what laws he had breached or how he had compromised security. The BBC's Thabo Kunene in Bulawayo says his relatives are angry that he was tried before a police tribunal without lawyers present. Mr Mugabe, who has been the leader of Zimbabwe for the three decades of its independence, is currently in a power-sharing government with long-time opponent, Morgan Tsvangirai.